Label Source recently asked us to give their old website a new, more modern-looking design; more specifically, they wanted to make it easier for smartphone and tablet users to view Label Source's products and make purchases online. We're pleased to announce that Label Source's new and improved website is now live - visit www.labelsource.co.uk now to see how it looks. Responsive Design - As mentioned above, one of this project's key aims was to ensure a good user experience on smartphones and other mobile devices. The new Label Source site has a fully responsive design that looks great and is easy to navigate on screens of all sizes. HTTPS Encryption - The entire Label Source website is now under HTTPS (as opposed to HTTP). This means that all information entered on the Label Source site is now sent securely, so the company's customers can place orders safe in the knowledge that their data is encrypted. Improved Back End - We also updated the back end of the Label Source website to make it easier for the company to manage their product options and category pages. Do you have an ecommerce website that's in need of a redesign? Contact Designer Websites for a quotation! A successful ecommerce business is a complex collection of business processes, automation, and manpower. This varies significantly among industries, but one thing is for certain, you need to rank well in the major search engines in order to achieve high-volume sales. Otherwise, you’ll be dependent upon advertising platforms like Google AdWords or Bing Ads. Now, let’s go ahead and assume you have a good quality ecommerce website and you just want to focus on the further optimisations. Below you will find a few simple SEO techniques that you can utilise to enhance your chances of higher rankings for your ecommerce website. Once you have your list of keywords it’s a good idea to map each keyword phrase to a specific page on your ecommerce website. For this, we would recommend that you use a spreadsheet as it can get lengthy and disorganised unless in some sort of manageable order. Now, a big no-no in the world of optimisation is duplication, whether that’s duplicate paragraphs or just duplicate keywords. If you’re targeting the same keyword with multiple pages then Google will likely choose to only display one of those pages in the SERPs (Search Engine Results Page), which may mean you miss out on opportunities to be seen. For example, let’s say that you have an ecommerce website that sells safety harnesses. You could just label all of the products a “safety harness” and still be factually correct, but the chances are you likely have a “Climbing Harness”, a “Rescue Harness”, a “Fall Arrest Harness” and so forth. Therefore, in order to capitalise on a wider number of searches, you should first find out how your customers search for safety harnesses. Look at how they phrase their search and even the types of questions they ask surrounding that product. The next step is to make sure you address each of those searches with a page for that product, using the keyword phrase that you’ve identified. I know the question you’re about to ask... in those examples, isn’t the word harness repeated? Well-spotted. Yes, it is, but rest assured that Google is not that pedantic and will be able to tell the difference in your meaning (they’re quite clever in that way). Duplication is usually picked up from repetition of the same words in the same format. So, if you try to rank 2 pages for the keyword “Rescue Safety Harness” then you would be better off setting the copy on one page as “Confined Space Harness” and the other as “Rescue Safety Harness”. This way, Google will see the difference and potentially rank both pages, whereas if both are just set as the latter then it is highly likely that only 1 of those pages will be indexed. Ecommerce websites quite often have hundreds of pages for each of their products, so this may seem like a tedious task. However, you should see this as an opportunity to rank for hundreds of different keywords. If you optimise your copy well enough, you may find your website reaches first page positions for a wide range of searches, which will result in much higher volumes of traffic. Depending on the amount of copy on the page, it is usually recommended to stick to just one keyword per product page. This will allow you to target that keyword more efficiently, than if you were attempting to target multiple keywords at once. If you are instead writing a category page or a home page which usually has more content, you can try to target 2 or 3 keywords if you feel it’s necessary. When looking at the SERPs, your title tag is your first opportunity to get your consumers attention. 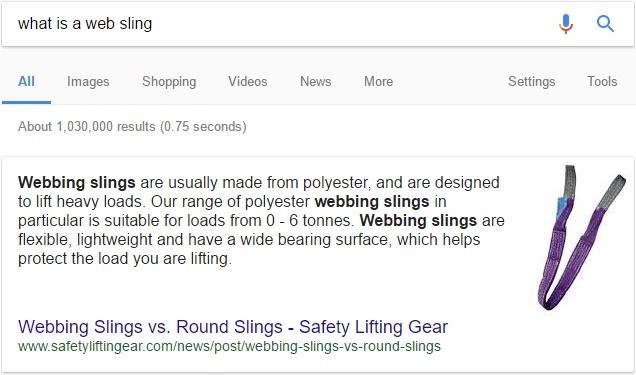 The meta description is then the snippet of information which will convince your consumers to click through to the website. This is why it is so important to get these aspects right. Google specifies that it is ‘important to have distinct, descriptive titles for each page of your site’. This is because it needs to be clear to the consumer what that page entails and shouldn’t be too similar to a page displaying an entirely different product. It is also important to try and include your chosen keyword in your page title and meta tag as this will clearly show Google what your page is about. Your meta description also needs to clearly explain what your page is about in a couple of sentences. In previous years, meta descriptions were only allowed to be around 160 characters before they were truncated by Google. Now, new SERP changes mean meta descriptions can now be displayed up to 278 characters. This should be more than enough length to include at least one instance of your keyword and create a unique and concise description of the contents of the page. A blog on your ecommerce website is not only good for keeping your customers updated, it’s a great way to target more keywords. When you’re planning each page of your website and choosing unique keywords, there are sure to be a few that don’t make the cut. These can be targeted with blog posts. Plan ahead and write blog posts around these keywords in an attempt to bring more users through to the website. Try to provide informative content which will help your customers in some respect. This will not only help bring customers to the website, it will also create a level of trust between your company and the consumer. Another way blog posts can be utilised is to try and achieve the ‘featured snippet’ on the Google SERPs. Even if you’ve not heard of featured snippets before, you’ve most likely come across one. This is the result that usually appears at the top when you ask google a question. To achieve a featured snippet, you need to answer the question better than anyone else. It needs to be clear to Google that you have answered the question as accurately and concisely as possible. That means getting straight to the point and no filler writing (or keyword stuffing). Featured snippets have been referred to as search position #0 as they come above the search position #1. It has also been found that achieving the featured snippet can increase traffic to your ecommerce website by as much as 500%, in some cases. Utilising your blog to target keywords and attempt to achieve the featured snippet is a great way of increasing traffic to your website and improving ranking through the use of SEO techniques. We hope these SEO tips for Ecommerce websites have helped you plan your next steps in the digital marketing world. If you are looking for professional help with your ecommerce website, then please get in touch anytime. Phew, Black Friday is finally over! So now it’s time to relax, right? WRONG. Do you run an ecommerce website? Well, you can sleep when you’re dead, my friend. Okay, perhaps we are being a little bit dramatic, but when you’re this close to Christmas it’s actually time to put more energy into your website, not less. It’s the busiest time of the year for most retailers, and ecommerce has seen a huge increase in sales over the last few years. So if you are trying to make the most of your ecommerce website this Christmas, here are some tips. These days it’s not uncommon for people to have multiple devices, and different people will favour each for different things. In fact, last year there was evidence to suggest that many people used their mobiles or tablets to browse and research products before making a final purchase using their desktops. Whatever way someone chooses to access your website, you need it to perform perfectly - if your website doesn't work well on a platform it's not likely that someone will check if it does on another. Be sure that your website is responsive across all devices, allowing everyone to have a good shopping experience whatever way they decide to buy. We’ve all done it, one second you’re trying to get a new hoover and the next your shoulders deep in impulse buys including a TV you don’t need and gadgets that you won’t be able to work. But there they are, all ready for checkout… then suddenly, you’re struck by a delivery charge that snaps you out of your hypnotic-shopping-trance. Willing to spend hundreds of pounds of stuff you don’t need? Perhaps… Willing to spend £5.99 on delivery for said stuff? I think not. We aren’t saying delivery should always be free, but make sure you compare with your competitors. Up to 61% of people abandon during checkout because of extra costs. If they have seen your competitors offering better deals on delivery, it may be just the thing that gets them clicking away from your website. Similarly to delivery, it’s a good idea to keep an eye on what your competitors are doing here. Everyone loves a bargain, some people shop purely for the satisfaction of getting a good deal. 3 for 2 deals, discount codes, free next day delivery deals - all of these (and similar deals) give customers the impression that buying now is getting them the best value for money. Around Christmas this is particularly important, if you have a lot of people to buy presents for you'll feel particularly thankful for anywhere you can make a saving. Another thing to remember is with SO many brands having deals on this time of year, you don't want to stand out for the wrong reasons. T'is the time of year where your inbox is full of Christmas themed emails, but it really is a great way to remind customers that your website is worth visiting. Whether you're letting them know about a deal you're running, products coming back into stock, or sending a notification about an abandoned shopping basket (which have a 40% open rate), emails should attract attention and hopefully website traffic. It's important not to be too spammy, no one likes being bombarded with emails, but reminding customers your sale ends in a few days for example, is a great way to encourage them click directly through to your site. Make sure your emails are useful, engaging and to the point. Everyone loves being rewarded, the satisfaction of a job well done! What did your customers do to deserve a treat? Well probably nothing in particular, but it's still nice, isn't it? Giving exclusive codes to those who have shopped with you before or perhaps those who follow you on social media reminds customers that it's worth being interested in your brand. Ideally, you want to keep customers coming back and this is easy to do when they share good experiences with you. Peer to peer recommendations is also one of the best ways for your brand to gain trust, we appreciate our friends and family's opinions so it's always worth making sure every customer you have is happy with their service. If you need help creating an ecommerce website we are more than happy to help. Our team of specialists are experts in creating bespoke websites that best represent your brand and services. Request an ecommerce website design quote here. Online Beer Pong Shop - Designed & Developed by Designer Websites! Invented in America sometime in the mid-20th century, beer pong is a drinking game that has achieved international popularity in recent years - it's become a staple fixture of student house parties, and it's not hard to see why! While avid players have come up with countless different variants, the basic rules of beer pong are very simple and incredibly easy to pick up: all you have to do is throw a ping-pong ball at your opponent's formation of cups, and if the ball goes in, they have to drink that cup's contents (usually beer). Empty cups are removed from the game, and play continues until one player runs out of cups. This deceptively straightforward premise has spawned a whole industry: you can now compete in beer pong tournaments, hang out with your friend at beer pong bars, and purchase all kinds of beer pong products and accessories to help you play. All of which brings us to Designer Websites' latest project: www.beer-pong.co.uk, an ecommerce website dedicated entirely to beer pong! The Beer Pong UK website has a fun, modern design and a layout that's as simple as the game itself. From one page, beer pong fans can browse beer pong sets, brush up on the rules, and download handy printables (including a tournament bracket and a 'how to play' guide). The website also has a 'Drinking Game Ideas' blog in case you need any inspiration for your next big party! We're very pleased with the finished version of this new website, and its responsive design means that you can buy your beer pong gear via smartphone or tablet just as easily as you can on your PC. Visit the Beer Pong UK site now to take a look at our latest work, or contact Designer Websites if you need a quote for your own online project. Previously on this blog, we shared 5 top tips for instilling trust in first-time customers and encouraging them to buy from your ecommerce website. Today, we'd like to look at the next step: enticing those customers back to your website for a second purchase. Converting one-time customers into repeat customers is arguably an even bigger challenge for ecommerce retailers than securing that key first transaction. According to Entrepreneur, only 32% of ecommerce consumers placed a second order with an online seller within a year of their first. However, it's well worth making an effort to clear that second-sale hurdle; once a customer has made two purchases from your website, there's a good chance they'll make a third...then a fourth...and so on. But how can you magically transform your one-off buyers into regular customers? Below are five useful tips from the ecommerce experts and marketing specialists who work here at Designer Websites - read on to learn how to bring customers back to your site time and time again! The most obvious and most popular way to bring customers back for a second purchase is simply to email them. If the customer entered their email address at the checkout (and opted in to receive correspondence from you in the future), it's definitely in your best interest to stay in touch with them, and services like MailChimp have made it easier than ever before to do this. When constructing an email marketing campaign, it's important to strike a balance between silence and spam. If you don't email your past customers often enough, they may well forget all about your brand and the service you provided for them; send too many emails, however, and your customers may get annoyed and unsubscribe from your list altogether. Think carefully about how often you'd want to hear from a company like yours - once a month is usually a fairly safe starting point, although the ideal frequency will depend on the industry you're in and the actual content of each email. Rather than including your entire customer base in every generic email campaign, you may get better results if you split your mailing list into segments (e.g. 'People who bought shoes', 'People who made a purchase near Christmas') and send tailored mailers to each of these segments. Arrival of a new product that's similar to one the customer bought previously. We know you love Adele - her new album is available now! Special offer on a type of product the customer purchased previously. One year on from a seasonal purchase the customer made previously. Autumn is here again - do you need a new coat? Social media platforms like Twitter and Facebook are perfect for keeping in touch with past customers and making sure you stay on their radar. Once a customer has followed your company on Twitter, for instance, all you have to do is tweet regularly and your brand - your logo, your company name, your latest news and updates - will keep appearing in their feed, reminding the customer that you exist and that your online shop is still very much open for business. Of course, the tricky part is actually persuading people to follow you on Twitter (or Facebook, Instagram, etc.) in the first place. Here are a few ways to accomplish this beyond simply asking people to follow you when you send them the receipt for their order. Display recognisable social media icons prominently on your website and in emails, and make sure that these buttons actually go to the right URL when clicked. Far too many companies put the Twitter logo in their website header but forget to actually link it to their Twitter account! Post well and post often. In order to make your social media page an appealing prospect to potential followers, you need to demonstrate that you're a) active, and b) interesting. You'll have a hard time attracting new followers if your last post was six weeks ago, or if every single post is just a link to a product on your website. You - or your social media manager - should be aiming to post frequently, and to post a good variety of content that is nevertheless consistent with your brand and the wants and needs of your customers. It's a bit of a balancing act, for sure, but get it right and you should find that your customers are far happier to follow you online. Make your company's brand compatible with the customer's personal brand. Individuals have their own 'brands' just like companies do, and if a person considers their social media account to be an integral part of their personal brand, they won't follow anyone who is inconsistent with that brand. Someone who sees themselves as being glamorous and trendy might be reluctant to follow, say, a pest control company on Twitter, even if they frequently use that company's services. With this in mind, here's a useful exercise. Ask yourself who your customers are and how they perceive themselves; now, ask yourself how your business fits into that perception. If your customers are serious, no-nonsense business owners, then present yourself as a serious, no-nonsense business on Twitter. If your target audience mostly consists of stay-at-home parents, then tailor your social media posts to stay-at-home parents. This isn't just a question of tone (although that's certainly part of it). Think of it this way: if, every time you liked a Facebook page or followed a company on Twitter, you had to put a bumper sticker on your car saying 'I ❤ [Company Name]', which companies would you follow? Which brands fit your personality well enough that you'd be happy to endorse them to the driver behind you at all times? This may sound like an odd comparison if you don't really play the social media game yourself, but a lot of people curate their 'following' list very carefully as they consider it a reflection of their own personality. Your goal is to be the sort of company they don't mind associating themselves with. Allowing your customer to register an account on your website will make it a little bit easier for said customer to come back sometime in the future and place that all-important second order. If, while finalising purchase #2, Mr Jones can simply enter a username and password instead of typing in all of his personal details from scratch, this will give him a better overall experience, thus increasing the chance that he'll both complete this order and use your website again the next time he needs a present for his mum. A word of caution, however, while some customers will happily create an account in order to save time in the long run, others will resent you for forcing them down this route instead of just letting them check out as quickly as possible. The best idea is to let people decide for themselves: many of the ecommerce websites we've built let people register an account if they want to, but also offer an 'Express Checkout' option for people who want to go straight to the payment screen. If you want to turn a one-time customer into a customer for life, it's crucial that you do whatever you can to endear yourself to that customer. The most important part of this is just providing a solid service, both while they're on your website and afterwards; in other words, you need to make sure that your website is easy to use and that your courier delivers the goods on time and as described. Ticking those two boxes lays a good foundation for consumer loyalty, but in order to really seal the deal, you need to go the extra mile - do something that will set you apart from the competition and make sure the customer remembers you fondly. The easiest way to win hearts? Include a personal note in package you send to the customer - not a generic form letter, but something genuine that's specifically for that one person. Just a quick note to say thanks very much for using our website. Hope you enjoy the book - I read it myself when it first came out and I have to say I couldn't put it down. Fingers crossed you find it just as compelling! If there's anything else we can help you with, please don't hesitate to ring the office or drop me an email. You can also find us on Twitter, so feel free to say hello if you're on there too! A note like this shows the customer you care and gives them a glimpse of the real people behind the company - often a sticking point for retailers who sell exclusively through an online storefront as opposed to a bricks-and-mortar shop that's staffed by smiling faces. As an added bonus, these letters also give you another place to plug your social media accounts (as in the example above) and/or offer the customer another little incentive to revisit your website soon. What sort of incentive, you ask? Not only does this letter endear the company to the customer and encourage him to follow the company on social media, but it also gives Edward an extra reason to go back for another purchase. Once he's finished his book and needs something new to read, he'll know that he can get his next page-turner for 15% less if he goes back to Great Reads. If you need an eCommerce website that functions flawlessly and keeps customers coming back time after time, we at Designer Websites are the people to call. Click below to request a quote, or telephone 01446 339050 to discuss your requirements. If you sell products online via an ecommerce website, one of the biggest challenges you'll face is convincing new users to take the plunge and buy from you for the very first time. It's common for e-shoppers (particularly those who are accustomed to huge online stores like Amazon and eBay) to be a little uncertain when using an ecommerce website that they've only just discovered; at this early stage, they probably have no idea whether or not you're able to provide a satisfactory service, and more cautious users may even worry that your online payment system isn't secure enough. For this reason, establishing trust should be a key priority for any ecommerce website owner. If you don't do a good job of presenting yourself as a reliable and trustworthy retailer, the people who stumble upon your website may be very reluctant to actually purchase anything. Use reviews to demonstrate your reliability. One of the most popular ways to instil confidence in online consumers is to show them reviews from people who bought the same item(s) from the same website in the past. However you choose to present them, populating your product pages with reviews from previous customers will really help new customers to feel less like they're venturing into the unknown. Of course, the one drawback of this system is the possibility that customers might leave negative reviews, thus potentially making newcomers even more reluctant to purchase anything from your website. Fortunately, there are a few different ways to combat this problem. Some websites allow sellers to post public responses to customer reviews, meaning that anyone on the receiving end of a one-star rating has the opportunity to explain what happened and possibly redeem themselves in the eyes of future visitors. Alternatively, you might consider implementing a review moderation system that allows you to decide which reviews actually get published on your website (this is a good way to prevent people from posting abuse or lying about your company). Still, if you provide a satisfactory service, you can probably depend on your customers to be kind in their reviews. And even if you do occasionally receive unflattering feedback, your site will probably still look more appealing to new customers than if you had no reviews whatsoever; a site with fifty positive reviews and five negative reviews will generally be seen as a better bet than a site offering no information at all on the experiences of previous customers. Choose a trusted, well-known payment system. For most of us, buying something online is now just as humdrum and as commonplace an activity as popping to the corner shop for some milk, and yet we're still very careful about giving away our financial information online. We're right to be cautions, of course - in 2014, fraud losses on UK-issued cards totalled roughly £479 million - but that caution can be hugely problematic for honest ecommerce retailers who need people to have faith in the concept of online payment. The most straightforward way to convince customers that your checkout is secure? Use a well-known payment gateway like Sage Pay or PayPal. People tend to recognise names like these (in the case of PayPal, they may even have an account already set up), and this will help them to feel at ease when they're entering their card details on your website. If you decide to use a different payment gateway, be sure to do your homework first. Find out whether or not the payment provider is trustworthy and reliable, and make absolutely sure that payments will be handled over a secure connection (HTTPS). Show the human face of your business. There are many reasons why consumers are generally more comfortable spending money in brick-and-mortar shops than on ecommerce websites, but one big reason is the lack of human faces. When you buy a book from your local Waterstones, the payment is handled by the person behind the till; they answer to a supervisor or manager, who in turn answers to someone at head office. There's a sense of accountability that's often absent when purchasing online, where it's easy to feel like you're buying from a machine with no human oversight. Happily, this feeling is easy to dispel. It's a good idea to a 'Meet the Team' page to your website (here's ours) in order to introduce your customers to the people behind the machine; if you've got time, you may also want to consider sharing some photos from around the office on your blog and/or social media accounts. This is a great way to demonstrate that your online business is every bit as 'alive' as any high street shop, and that there are real people dealing with each order and reading each email. Ensure that your website is functional and modern-looking. Pages that load slowly...or not at all! If you're raising any of these red flags, it will massively affect consumer confidence - after all, if you've made mistakes on your website, what's to say that you won't make mistakes with the orders you ship? On a related note, it's important for any serious ecommerce retailer to invest in a clean, modern-looking website design. Your website is your shop floor, and if you don't make it look appealing, people will be markedly less inclined to stay and browse. This isn't just an aesthetic issue, either; a poor-quality design can be difficult to navigate, and if it looks particularly outdated, people may even get the impression that you're no longer in operation - they might think you've abandoned your online store entirely and moved on to pastures new, leaving the site to gather dust in some forgotten corner of the Internet. We'd also recommend opting for a responsive website design, as this will provide mobile and tablet users with a far better purchasing experience. Millions of people now regularly use portable devices to shop online, so you're potentially missing out on a big chunk of the market if you stick with a non-responsive design. Make yourself easy to contact. Nobody's perfect, and even the best companies make occasional mistakes. It would be fantastic if you could eliminate all issues within your business, but in the first instance, it's more important to ensure that customers can easily report and resolve their issues when they arise. So here's what you need to do: list your company's contact details PROMINENTLY on your website (e.g. in the site header, or on a contact page that's linked from the main site menu) and make sure that those contact details are up to date and active. You should ideally list as many different contact methods as possible; some people will want to send you an email, while others may prefer to speak on the phone. You might also consider listing office opening times, in case anyone is expecting you to answer the phone at 8pm on a Saturday. Offering a live chat option is another great way to be there for your customers, but don't make this commitment unless you're actually prepared to answer all the chat messages that come through! Live chat isn't email - when people see a window like this, they'll expect somebody to answer their enquiry straight away. In order to earn the trust of new customers, you need to do whatever you can to reassure them of those four things. We hope this blog post has shown you a few ways to do that - if you can think of others, please do let us know on Twitter! To request a free quotation for your ecommerce project, please click here. PalleTrucks-Trolleys.com is a brand new ecommerce website that sells a wide range of materials handling products, including site trolleys, pallet trucks, material lifts and more. The site was designed and developed by the Designer Websites team, and it went live yesterday - please click here to view it. This project came about because one of our existing clients (a company that offers a huge variety of different products, including heavy lifting equipment, height safety gear and PPE) wanted a separate website that specifically centred on their range of materials handling equipment. The primary purpose of this new website would be to target a broad array of search terms related to pallet trucks, site trolleys, and so forth; while these product ranges are represented on the company's main website, we agreed that a new site with a more concentrated keyword focus would have a much better chance of conquering Google's SERPs. Our SEO (Search Engine Optimisation) experts performed extensive keyword research to ensure that every page of the PalleTrucks-Trolleys website was targeting the best possible search terms in the proper manner. PalleTrucks-Trolleys.com is a responsive website, meaning that it looks great and functions smoothly on screens of all sizes; this is another important consideration when it comes to search engine optimisation! Visit PalleTrucks-Trolleys.com to see the results of our hard work, or click here to request a quotation for your own ecommerce website. With Sage predicting £1.7 billion to be spent this year, it’s clear that the increase in Christmas sales is not simply due to the fact that everyone’s feeling a little more charitable during the festive season. ‘Fear of Missing Out’ is an important factor in urging people to part with their money in cases where they would normally abstain from buying, which plays on our primal hunter-gatherer instinct to prioritize our survival of over that of others. While the conscious, logical mind knows that the prospect of getting a brand new television over the next person is far from being a life or death situation, 39% of shoppers said that the concept of getting the best deal was what urged them to buy. Consequently, 60% of shoppers admitted that they later regretted buying a bargain due to lack of need or use for the product, which demonstrates just how easy it is to play on people’s instincts in order to override the voice of reason which would usually prevent them from taking action. The Hyper-Maximisers: Have a detached relationship with their money, spending it on things they need rather than want. Furthermore, they put a great deal of energy into finding the best deal and being careful with their money. Old School Savers: Careful with their money and unlikely to splash out, they are put at a disadvantage by their slow adoption of technology. Old School Spenders: Impulsive and carefree with money, focusing more on the short-term than the long-term. They are more likely to pay in cash. Click and Collectors: More likely to spend on utilitarian needs rather than hedonistic wants, although such purchases are not typically price-sensitive. More likely to use technology for convenience rather than saving money. Carefree Clickers: Use technology in their purchases for the experience’s sake rather than to save money, and are more likely to splash out on a treat than on essentials. Cash Flashers: less likely to go cashless; their relationship with the cash they spend is both conspicuous and carefree. Sanctioned Indulgers: Members of this group are careful with their money, but tend to spend it on indulgences and associate it with emotional benefits. They are not particularly open to new financial technologies. Hunter-Gatherers: Risk-averse savers and budgeters who use the latest gadgets to help them in this quest. They are likely to enjoy this process of hunting for bargains and use technology to save money. With Sage predicting £828 million to be spent on Cyber Monday this year, it’s interesting to consider how the popularity of online shopping could cause the in-store Black Friday deals to become somewhat obsolete. Apparently 71% of us prefer shopping online simply out of convenience, but it also seems to be an environment in which we are more willing to make larger purchases and spend impulsively. 43% of UK shoppers said they experienced feelings of guilt when handing over cash; a process which is eliminated by the ease of online transactions. Professor Mitchell noted that “in the online world, the reality of things such as money can get distorted, removing the guilt we associate with face-to-face spending”. With many of the negative experiences associated with in-store shopping removed, it is hardly surprising that online sales are progressively out-performing those seen on the high street. In conclusion, Sage noted that while the Christmas shopping scramble is an important time for retailers, they should also remember to consider long term loyalty when targeting their customers. While impulse inspiring deals can prove to be profitable short-term, a universal model won’t keep customers coming back. Retailers should be catering to different types of customers by selling and promoting in different ways, in order to alleviate feelings of remorse and secure a sense of loyalty. Business should also keep in mind their capabilities and resources before attempting to keep up with larger corporations, in order to ensure that any action taken is good for their business as opposed to being detrimental to their reputation. Ecommerce websites are typically a lot more complex than brochure websites. For one thing, ecommerce websites require some kind of online payment system, but there's also the issue of sheer size - by dedicating an entire page to each and every product you sell, you're potentially saddling yourself with a website that's hundreds or even thousands of pages deep. Every page should have its own unique title tag. Google's guidelines demand "distinct, descriptive titles for each page on your site", and this includes the many product pages that form the bulk of your ecommerce website. The page title tag is an extremely important ranking factor for search engines, and since you ideally want all of your product pages to rank highly for relevant search terms, it's a good idea to come up with a different title tag for each and every one. This dark blue lampshade is handmade by the experts at Spiffing Shades, and includes a dual purpose fitting that's compatible with ES and BC lamps. The recommended maximum length for a title tag is just 55 characters, so the meta description is a good way to go into greater detail about the page you're optimising. You might think that, once each of your product pages has its own unique title tag and meta description, you don't have to worry too much about what's actually on the page. Unfortunately, if you're serious about conquering your competition in the Google rankings, you'll need to write unique copy for each of your product pages as well. This task can be particularly tedious if a lot of your products are very similar to one another, but it still has to be done. If Spiffing Shades sell a hexagonal lampshade in five different colours (red, blue, white, yellow and black), the company's copywriter will need to write five different descriptions to give each product page the best chance of ranking. Of course, Spiffing Shades could simply choose to list the hexagonal lampshade as a single product, with customers selecting their preferred colour via a drop-down list; this would mean less work for their copywriter, but that single product page would struggle to rank for colour-specific terms like 'hexagonal red lampshade' or 'black lampshade hexagon shape'. If Google finds multiple pages that all look alike, it will usually only index one, which means that all the other similar pages cannot possibly appear in search engine results. Too many identical pages may even result in an outright Google penalty that affects your entire website - is it really worth taking that risk just to save a little time on writing product descriptions? Put your most important products on the homepage. We at Designer Websites have created a lot of ecommerce websites in our time, and one thing we've noticed on numerous occasions is that product pages seem to rank significantly higher when linked to directly from the homepage. This may be because putting a product on the top page of your website makes it much easier for bots to find, crawl and index; whatever the reason, it seems to work, so if there's a particular product that you'd like to see on the first page of Google results, we'd always recommend including that item among the products listed on your homepage. Put some effort into your images! Images are an absolutely crucial factor for any ecommerce website - whether you're selling cookers, toys, laptops, or combine harvesters, nobody will be interested unless they can see what they're buying. But that's not the only reason to make sure you've got high-quality images for each of your product lines. There's also the small matter of Google Images; we've seen websites pull in thousands of visitors every month from image searches alone, so it's well worth getting your pictures done properly. Attractive, eye-catching product images will help you to stand out from all the other image listings (they're also essential for a successful Google Shopping campaign), and adding clear, concise alt tags to each of your images will help them to get closer to the top of the results page. Need more help with your ecommerce website? Get in touch with Designer Websites for a quotation - whether you need some website optimisation or a brand new website design, we'll listen to your requirements and work to achieve the results you want! It's easy to imagine the benefits of having multiple ecommerce websites - if one ecommerce website can drive a hundred sales a day, then a trio of ecommerce websites should theoretically be able to drive three hundred sales, right? However, setting up a multi-site ecommerce solution is both expensive and time-consuming, so before you get started, you need to be absolutely sure that it's the right choice for you. Here are a few different ways in which multiple ecommerce websites can benefit a business - do they apply to yours? Some products are suitable for many different audiences. There are lots of disparate groups who might be interested in purchasing drinking accessories, for example; you've got university students, hen parties, stag parties, nightclub/bar owners, and goodness knows who else. This is great news if you specialise in drinking accessories, because it means you've got loads of potential customers to sell to! However, this can pose a problem when it comes to your ecommerce website. If you're simultaneously trying to market your business to all of the groups listed above (and probably several others besides), you won't look like a particularly appealing choice to any of them - instead, the hen parties will probably go to a website that deals specifically in hen party accessories, the bar owners will go to a trade website for industry professionals, and so forth. Setting up multiple ecommerce websites is a fantastic way to tackle this problem. If you've got three completely separate websites stocking the same products, this allows you to target three completely separate audiences. You can make one pink and glamorous to appeal to the hen night market; the second can look slick and professional, so as to rope in the nightclub owners; and the third could be used to highlight your biggest discounts, which is sure to please those thirsty students! Search engine bots are a lot like the customers mentioned above: they'll be more interested in your website if it's specifically targeted at the market you're aiming to conquer. For example, that generic drinking accessories website of yours will probably never rank for terms like 'hen party shot glasses' or 'wholesale pint glasses', because these things form only a small part of your overall offering. Unless you're Amazon or someone similarly huge, you'll generally find it very difficult to compete for keywords that are only tangentially related to your business. You'll find it a lot easier to rank for those keywords if you've got an entire website dedicated to each set; just as the hen party planners of the world are more likely to click on a website that's specifically designed for them, Google are far more likely to show your website to those party planners if you look like a hen party specialist. If you're one of those companies that sells all sorts of different products, squeezing your entire range onto a single website can be a serious headache. If you've got the budget, it may be much easier to spread your stock over several ecommerce websites rather than trying to cram it all into one place. "This one's a flooring website, and this one's a wallpaper website, and this one sells furniture!" "This is a website that sells...um...stuff for decorating your home with." Fewer product ranges per site equals stronger overall focus, and focus is key if you want to make a big impression on potential customers. If you have several different ecommerce websites then you also have the ability to create several different brands, and this in turn gives you the scope to set up several different accounts on Twitter, Facebook, and the other big social platforms. The benefits of this are reasonably obvious: you can accrue multiple sets of followers from multiple demographics and interact with them in multiple different ways! One of the best ways to make the most of having multiple brands on social media is to establish a distinctive voice for each one. For example, if one of your ecommerce websites sells gadgets and techy stuff, you can adopt a 'geeky' persona for that brand, weighing in on the latest tech news and pop culture gossip on Twitter whilst also sharing your own products. Then, if you're selling those same tech products in a slightly more professional capacity (e.g. to businesses) on a second ecommerce website, you can set up another Twitter account for that site and use a more formal tone to speak with your customers in the industry. If you want to get really ambitious, there's another fantastic way to profit via multiple ecommerce websites that we haven't yet touched on. We at Designer Websites have helped several clients to set up 'affiliate' systems - this means that we create a white label ecommerce website for that customer, who then sells that website design to clients of their own. Each client (or 'affiliate') can brand and customise their own website in any way they please, but they're all selling the same products, and all of the affiliate sites are built upon the same original code. Here's the upshot of all this: you can drive more sales for your business by allowing others to market and sell your goods via ecommerce websites of their own. Your affiliates will be happy because they're getting a cut of the money you make, and you'll be happy because your sales are going through the roof and other people are doing all the legwork for you! If you have a large product range, multiple target audiences, and/or the desire to set up an affiliate marketing system, then a multi-site ecommerce solution may well be a great choice for your business. Click here to get a quote for your project, or visit our Multi-Site Ecommerce page for more information and some examples of our previous work in this area. Do I Need an Ecommerce Website? We specialise in ecommerce websites here at Designer Websites, and so we often receive enquiries from business owners who are wondering whether or not ecommerce is the right choice for their company. More often than not, the answer is a resounding 'yes' - ecommerce is a fantastic way to grow your business, reach new customers, and increase your profits. However, we do occasionally come across clients for whom an ecommerce website simply wouldn't make sense; sometimes, it's better to have a simple brochure website that drives lots of enquiries than to have an awkward ecommerce website that makes life difficult for potential customers. You sell a wide range of products. Websites are capable of showcasing far more products than a bricks-and-mortar shop, and if you have a lot of different items on offer, an ecommerce site will probably be the single most efficient way for you to sell. You wish to market to a wider audience. If you're only selling from a physical location at present, you're only reaching a tiny percentage of the market (i.e. those within travelling distance of your shop). Even if you have multiple locations, that's still nothing compared to the reach of an ecommerce website - imagine what could happen if you made your products available to the entire country, or even the entire world! You already have a non-ecommerce website that gets a lot of traffic. If you have a website that doesn't allow people to buy your products, chances are you're missing out on a lot of sales. Many internet users now expect the option to purchase online, and if your website doesn't offer this, you'll lose your customers to a website that does. The solution, of course, is to upgrade your site with ecommerce functionality - you'll be improving user experience, and since your website already has some history with the search engines, it will likely rank much higher than a brand new website would. You aren't equipped to deal with a large volume of orders. Opening up your business to the whole country (and possibly beyond) will almost certainly result in a lot more orders. This is great news if you can handle the demand, but if you can't, things will very quickly turn sour, especially if customers aren't receiving the goods they've paid for. In the age of the internet, disgruntled consumers can ruin a company's reputation astonishingly quickly! You only want to target a small area. Want to keep your business local? If so, ecommerce may be the wrong choice for you, particularly if you don't have the means to fulfil orders from outside your chosen territory. That said, we have produced ecommerce websites for a few region-specific businesses, and they've done very well indeed - just make sure that visitors know right from the outset that your site only caters to one location! Your products are too complicated for ecommerce. Some things simply can't be sold directly over the internet. This is often the case for companies who specialise in bespoke items; it is possible to integrate some customisable features into an ecommerce website (for example, we have built sites that sell things like personalised clothing and customised labels), but after a certain point, it just becomes too complicated for the end user. Alternatively, perhaps you'd rather get people on the telephone instead of selling to them online - giving your customers a phone number instead of an online checkout allows you to speak to them personally, provide a better solution for their requirements, and perhaps even upsell your products and make more money! Click here to get a quote for your own ecommerce website, or - if you're still not sure - feel free to email info@designer-websites.co.uk for more information. Ecommerce Website: Which Payment System Should I Use? Will this payment system make it easy for my customers to pay me? Does this payment provider have a good reputation for security and reliability? Is this payment system reasonably cheap to use? Is the interface for managing payments and refunds easy to use? Here at Designer Websites, we are extremely well-versed in the selection and implementation of online payment systems. We have built ecommerce platforms for hundreds of businesses, and in this blog post, we will look at three of the most popular payment providers on the web. Do they meet the above criteria? And how will their services suit your business? Will this payment system make it easy for my customers to pay me? Yes. Sage Pay's user interface could scarcely be more straightforward - it's simply a case of entering your details and clicking 'Proceed'. The system also has tokenisation capabilities that allow users to save their details and skip all that tedious typing next time around. Does this payment provider have a good reputation for security and reliability? Sage Pay have a Trustpilot rating of 9.6 out of 10, which should give you a good idea of how trustworthy they are. Furthermore, the Sage system uses a variety of fraud prevention tools and security measures to ensure that payments are completely protected. Is this payment system reasonably cheap to use? Sage Pay's ecommerce system is one of the most cost-effective on the market, offering a range of reasonably-priced payment plans to suit businesses of all sizes. In our opinion, their charges are more than reasonable. Is the interface for managing payments and refunds easy to use? We believe that the MySagePay console is one of the best features of their payment gateway. It is incredibly intuitive, comprehensive, and simple to use. Many of our clients ask us to integrate Worldpay into their ecommerce websites, so we have a lot of experience with this system as well. Will this payment system make it easy for my customers to pay me? Again, yes; Worldpay is relatively good and makes taking payments online easy. However, the Worldpay interface is not as user-friendly as that of Sage Pay. Does this payment provider have a good reputation for security and reliability? Worldpay's ecommerce system is very secure, but their Trustpilot rating of just 4.1 out of 10 reveals some serious problems with their service levels, reliability, and customer management. Is this payment system reasonably cheap to use? Worldpay isn't the cheapest payment provider, but they are far from the most expensive. It does depend on your payment plan, but this can be quite a cost-effective choice for some online sellers. In some cases, they are cheaper than Sage Pay. Is the interface for managing payments and refunds easy to use? Um...no! We think that the interface is very poor (at the time of writing this article), and sadly this lets Worldpay down significantly. They do have some nice features, but the interface is generally very clunky and awkward to use. PayPal needs no introduction - it is probably the best-known payment system on the web. If you've ever bought anything on eBay, there's a good chance you used PayPal to pay for it. But is it the right choice for your business? Will this payment system make it easy for my customers to pay me? Yes - if the customer already has a PayPal account, transactions can be completed in a couple of clicks. Even if they haven't registered an account already, it's very simple to sign up, and once they've registered, they'll never have to enter their card details again (unless those details change). Does this payment provider have a good reputation for security and reliability? They wouldn't be so popular if they didn't! That being said, PayPal have an extremely poor rating on Trustpilot (just 2.1 out of 10), with many people complaining that the company's customer service is very bad indeed. Is this payment system reasonably cheap to use? This is the biggest problem with PayPal: they know how popular they are, and they know that many online shoppers now expect all ecommerce websites to include a PayPal option. For this reason, they are perfectly happy to make you pay through the nose for their services, taking a sizeable percentage of every sale they process (more than 3% in some cases - this can really add up if you're taking a lot of orders via PayPal). In particular, Paypal is very expensive to use if you take a lot of transactions; if you don't, they may be a good choice. Is the interface for managing payments and refunds easy to use? Yes - they have clearly spent time designing this for ease of use and it shows. The interface is both very functional and very easy to use. If you live in Cardiff or the wider South Wales area, our latest project may well interest you. Kitchen Economy is a domestic appliance shop in the Roath district of Cardiff, and we're pleased to announce that their brand new ecommerce website is now live for all to see! The Kitchen Economy shop itself has been open for more than 30 years, and while the business did already have its own website, this site had begun to look very dated indeed. When Kitchen Economy first contacted us, they were interested in upgrading to a user-friendly ecommerce website that would allow them to serve customers from all over Cardiff and beyond; now that the project has reached completion, we are proud to say that this is exactly what we have provided. Kitchen Economy's new and improved website looks very modern indeed, with each type of appliance represented by a hi-res image in a simple, easy-to-navigate site menu. Whether you're looking for a cooker, a dishwasher, or something else again, the new design makes it easy to find and purchase. So, as we said before, Cardiffians in need of new white goods should visit www.kitchen-economy.co.uk as a matter of urgency - you can buy your new appliance(s) online, and the KE team will deliver to your door. They even offer a full installation service!